Muse will have a Tetris-inspired stage design when they headline Glastonbury tonight (24.06.16) - but expect something to go wrong. The British rockers are unable to use drones in their set this evening - as they have been doing on their aptly-named 'Drones Tour' - due to the music festival's ban on the flying gadgets, so have taken inspiration from the popular 1980s puzzle video game. 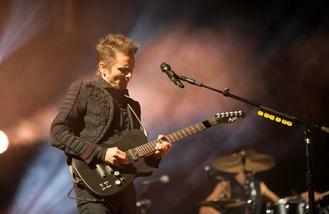 But frontman Mat Bellamy is already expecting something to go wrong. He told The Sun newspaper: "There are so many components that are unpredictable. "So there's no one to blame if anything goes wrong - which it will." The group will perform to more than 100,000 fans at Worthy Farm in Somerset, south west England, but Matt recently insisted he is naturally quite a shy person and has had to learn how to be a frontman on stage. He said: "I'm somewhat introverted. Introverts probably have a higher degree of outside stimulus and tend to back off. "Even now, I would probably be more inclined to just play the guitar and look at Dom (Howard) and Chris (Wolstenholme), rather than face the audience, but that's not really an option. "Those big productions helped push me out of my comfort zone. There's an element of the band that's been a great personal journey for me, coming out of my shell." Muse will be joined at Glastonbury by fellow headliners Adele and Coldplay, who will play on Saturday night (24.06.16) and Sunday night (25.06.16) respectively, as well as a host of other artists, including Ellie Goulding, Jess Glynne, Foals, ZZ Top and New Order.